KUALA LUMPUR: A ‘Datuk Seri’ and five ‘Datuks’ were among 114 individuals detained under the Security Offences (Special Measures) Act (Sosma) 2012 in Ops Cantas since 2015. Bukit Aman CID director Datuk Seri Mohamad Salleh said those detained were believed to be members of secret societies (gangsters). They were members of Gang 360 Deven (Klang Valley), Gang 24 (Penang), Gang William (Pahang) Gang Latino Dago (Colombia), Gang 04 Sungai Siput, Gang 21 Japan and Gang 04 Paper Kumar (Penang). “Police seized 22 pistols, one rifle, 916 bullets, cash RM167,193, two vehicles, jewellery and drugs worth RM1.75 million,” he told a press conference here, yesterday. The most recent was on Feb 3 where 38 members of Gang 360 Deven including four “Datuks’, were detained for allegedly involved in several cases of murder and kidnapping in the Klang Valley. Police seized eight pistols, one rifle, 768 bullets, 10.853 kg heroin, 20.807 kg syabu, six eramin 5 pills, 8 gm ketamine, two vehicles, jewellery and cash RM37,193. Of the 38 suspects, 22 were detained under Sosma from Feb 7 while 16 were investigated under Section 302 of Penal Code and would be detained under Sosma after remand under Section 117 of Criminal Procedure Code. 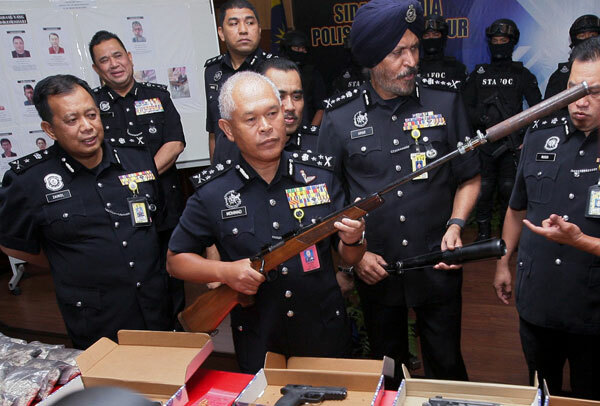 On Jan 27, police detained 22 members of Gang 24 including a ‘Datuk Seri’ under Sosma, together with three firearms, 60 rounds of ammunition and cash RM130,000. Nine others are still at large. Mohamad said police 10 members of Gang 21 Japan including a ‘Datuk’ involved in several murder and kidnapping cases in Iskandar Johor from 2013 to 2015. Five members of Gang William were detained under Sosma while another member was detained under the Prevention of Crime Act 1959 (POCA) for the kidnapping of a ‘Datuk’ in Bandar Indra Mahkota, Kuantan, Pahang, on Dec 26, 2015. Police also detained 10 members of Gang Latino Dago, several members of Gang 04 Sungai Siput and Gang 04 Paper Kumar.